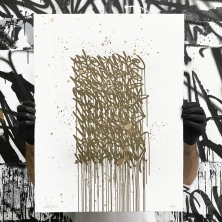 Nicolas Romero Escalada aka "Ever"
BISCO SMITH (b.1980) is an American contemporary urban artist whose work is characterized as a blend of graffiti deconstruction, abstract gesturalism, action painting, and style writing. His technique involves energetic, expressive brushstrokes that reflect the flow of music and translates the consciousness of the moment into painted lyrics and abstract black and white works of art. Bisco believes that art is energy transmitted through various mediums, and as such, the artist becomes the conduit. He aims to bring a good intention to all his paintings in hopes that the energy will continue to resonate wherever the art lives. His art captures the unseen rhythms of music, the untamed energy of a moment, duality, and good intentions. Bisco has exhibited art, performed music, painted murals, and partnered with creative brands and live events worldwide. Bisco's work is regularly exhibited in major markets and is collected by both national and international collectors.